Daveda Russell is an artist, author, and creative entrepreneur. She manifests installations, writings, and experiences that lift the voices and share the stories and life experiences of Black women and people systemically and circumstantially silenced. Daveda is the founder and president of Soul Light, a company committed to the healing and transformation of individuals, organizations, and communities. 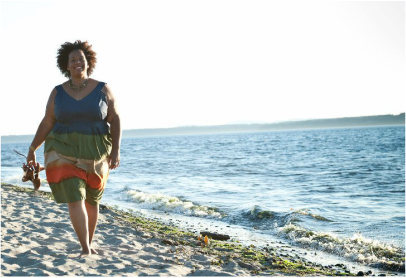 Before launching Soul Light in Southern California, Daveda served as an administrator, educator, and the founder and president of Nyawela Consulting in Seattle, WA. She is a Chopra Center Certified Primordial Sound Meditation instructor and licensed Brown Belt Nia teacher. Daveda believes in living a life of intention. For her, this means laughing loudly, hugging strangers, and embracing the healing power of sitcoms, ice cream, and sunsets.